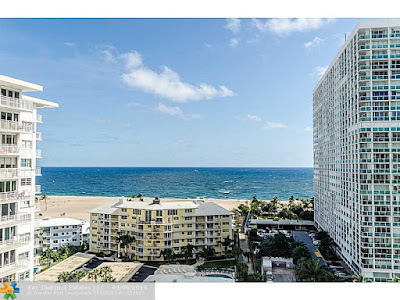 Broward Real Estate: Beautiful Condo In Fort Lauderdale Just Listed! This is an awesome opportunity to reside in an elegant newly remodeled from the studs up condo with direct ocean views in sunny Fort Lauderdale. This two bedroom and two bathroom unit is graciously spread out over a thousand square feet of perfectly appointed living space.The chef's dream kitchen has a full suite of stainless steel appliances, built in's with a beautiful wine cooler, sleek quartz counter tops, a warming drawer and custom cabinets. There is a washer and dryer in this unit. The storm shutters are electric. The new windows and sliding glass doors are all high impact glass. This building is located in the Harbour Beach area making it only steps away to the beach. This is a wonderful place for 55+ residents to live who do not have pets. Residents of Atlantic Towers have fine dining, shopping, and entertainment in close proximity at nearby Los Olas boulevard, The Galleria Mall, and The Broward Performing Arts Center. The Fort Lauderdale International and Miami International airports are just a short drive for travel convenience.